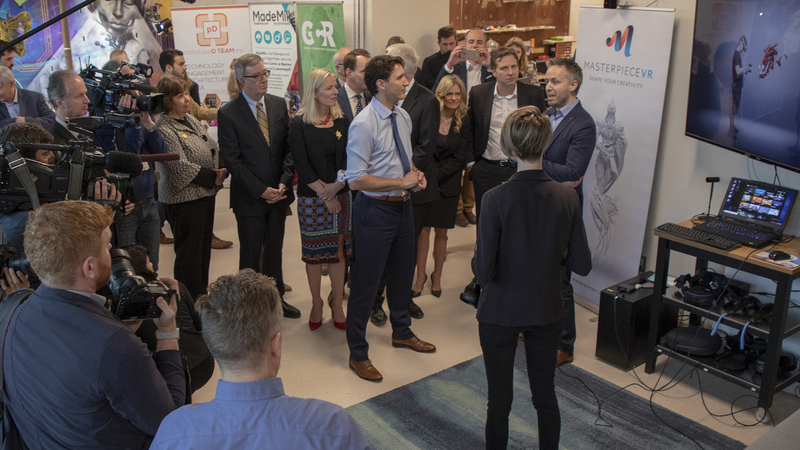 On April 25th we were honored with a visit from Prime Minister Trudeau and the Bayview Yards Innovation Centre. The Ottawa tech industry has been steadily growing and we are proud to be part of this community. Our company has been moving fast, and getting recognition worldwide by leading with some innovative solutions in 3D modeling. For our demo, we surprised Prime Minister Trudeau with a full body sculpt of him as Han Solo - created in less than 2 hours - and presented him with a high quality 3D print of this model, printed the same morning. It was a powerful demonstration of how our tool dramatically increases the speed in which high quality 3D content can be created. We were given the opportunity to share with Prime Minister some of our success, explaining that we are the first and only VR Creative tool that allows users anywhere in the world to enter the same space to create together in real time. We are also the first 3D sculpting tool in VR to add precision tools that make hard surface modeling intuitive and powerful. We showcased to the Prime Minister our current partnership with Microsoft and Samsung, which engages with artists around the world to Imagine and Create a Sustainable Future by modeling sustainable concepts in VR. These concepts are populating a growing city environment full of creative ideas around sustainability that people will be able to explore in VR. In the past six months we've won several awards including a Best Ottawa Business Award for #NextBigThing and a Cultural Startup Award. We were nominated for best Creative App of 2018 by UploadVR and have recently been nominated for an Auggie Award for Best Creator and Authoring Tool. We are excited to continue building on our success this year and leading with even more innovative solutions in the world of 3D creation and machine learning.